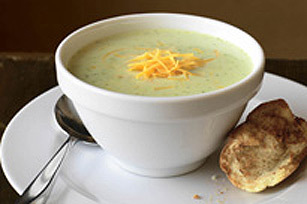 Follow this Broccoli-Cheddar Soup Recipe for a creamy, cheesy soup the whole family will love! Fresh broccoli helps make this soup a HEALTHY LIVING recipe. Cook onions in dressing in large saucepan until crisp-tender. Add broth, water and broccoli; stir. Bring to boil; cook 8 to 10 min. or until broccoli is tender. Stir in milk and rice; simmer on medium heat 5 min. Pour into blender in batches; blend until smooth. Return to saucepan; cook on low heat until heated through, stirring frequently. Serve topped with cheese. Substitute cauliflower for the broccoli.